10 easy steps for Do-it-Yourself Installation of Paver patios, driveways & pool decks. Start with a good level Measure and draw a diagram of the area you want to pave, noting any existing structures such as buildings, fences and other paved areas. Your local Decor dealer can help you determine the best stones and the proper amount of supplies you need. Contact your local utility companies before you begin excavation. Stake out an area approximately 12 larger than the area to be paved. Plan to slope the paving away from the buildings in the direction of normal drainage. Make sure that you have 90º corners at your starting point. You can do this by using the 3-4-5 triangle method. From the corner stake measure 3 across the base and 4 up the side. The diagonal line joining these two points should be 5. If it is not, adjust the 4 side until the diagonal is exactly 5. Where there is only pedestrian traffic, a base of 4-6 of processed gravel is recommended. To achieve this, excavate 7-9 to allow for base material, sand and pavers. Where there will be vehicular traffic or around pools a base of 6-8 of processed gravel is recommended. To achieve this, excavate 9-11 deep. Make sure to excavate 12 beyond the area you plan to pave. Compact the surface of the excavated soil with a plate compactor (you can rent these). In small areas a hand tamper may be sufficient. Fill the area with 3/4 minus crushed stone or aggregate approximately 5 thick. Compact this with the plate compactor. Wetting the gravel lightly with water will help with the compacting. When you can walk on the gravel without causing an indentation you can add the next layer of gravel and compact it. Continue to add gravel in layers until the base is approximately 3 to 3-1/2 from the desired level of the finished grade. Make sure to slope the surface for water drainage. The slope should be 3/16" per foot. Install a level line across the area using a line level. On the stake that is at the end you want to slope towards, move the line down 3/16" for every foot of pavement. For example, if your pavement will be 8 long, move the string down 1. Measure the distance from the line to the base. The distance should be equal all along the line. For example, if your pavement will be 8 long, move the string down 1. Measure the distance from the line to the base. The distance should be equal all along the line. Edge restraints should always be used to prevent the pavers from rolling or spreading. You can use PVC, aluminum, concrete or pressure-treated wood. Precast concrete curbs are recommended because they are easy to install, are very durable and will accent your paving stone. Use the 3-4-5 triangle method to make sure that all corners are exactly 90º. Before you can lay the pavers, a bed of sand must be prepared. Use 1 outside diameter galvanized electrical conduit, strips of wood or other suitable material, such as screed rails, and place them 6 to 8 apart down the area to be paved. Measure the distance from the string lines and the screed rails at several points. If necessary, adjust the height of the rails by putting sand under them or trimming the base underneath if too high. Hand pack sand around the rails to hold them in place. Spread 1 of sand between the rails until it is slightly higher than the rails. Use a 2 x 4 board to drag across the top to smooth and level the surface. Fill in the low spots and repeat. Remove the rails and fill in the indentations with sand, and trowel smooth as you are laying the pavers. Do not step on, compact or wet the sand after you have finished screening. 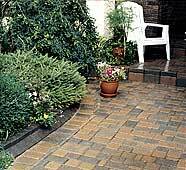 Starting in a 90º corner, lay the pavers in the pattern you have chosen. Work outwards keeping all joint lines straight. Use string lines pulled along joint lines and parallel to the edge restraints or, chalk lines snapped on the surface of the sand bed to keep the joint lines straight. Leave a 1/8 space between pavers. Periodically check the alignment of the rows by stringing a line along the front edge of the leading row. Each paver should touch the string. If adjustment is needed use a screwdriver and hammer to move it into place. Work off the pavers you have already installed but stay away from the edge so you do not disturb the sand bed. Install remaining edge restraints. Do not try to turn the pavers with curves in your laying pattern. Cut pavers to fit along the edge restraints. Measure and mark the pavers to be cut with a marking crayon. A diamond blade wet saw, paver splitter or a hammer and chisel can be used to cut pavers. Always wear safety glasses. If possible, keep edge stones to one half paver. Sweep the surface to remove any debris. Spread masonry sand over the surface, sweeping it into the joints leaving surplus sand on the pavers. Tamp the pavers down using the plate compactor. The excess sand on the pavers will cushion the surface and the vibration will assist in filling the joints. Spread more masonry sand if required. Make two or three passes at 90º to each other and re-sweep the surface. Sweep the remaining excess dry sand over the surface filling the joints. You will have to repeat this over the next few days as the sand settles and the rain compacts it. From start to finish it has been a pleasure doing business with you. Thank you for repairing the sidewalk as you said you would. I am a widow and, without my husband's help, the prospect of taking on the city for the sidewalks repair wa not a fight I had the energy to pursue. Your fixed the sidewalk meant alot to me on a personal level. By now you should have received my final payment. I will recommend your cpmpany to others. Thanks again. To ensure the security of your information, we ask that you type the codе in the text box.